Show your grandmother how much you love her with this beautiful necklace. The necklace has an engraved disc with place for all grandchildren. Looking for the perfect gift for mom? Choose this Filigree Tree Necklace with birthstones. 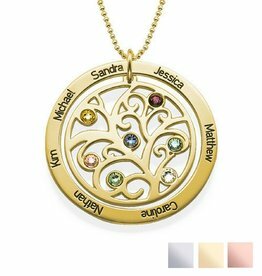 You can choose the birthstones of each family member, the names engraved on the silver plate. Including silver (0925) necklace. 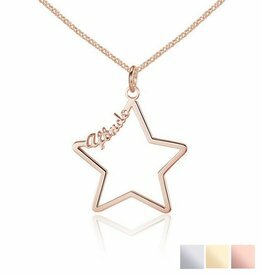 This beautiful necklace with star pendant is the perfect gift for any woman. 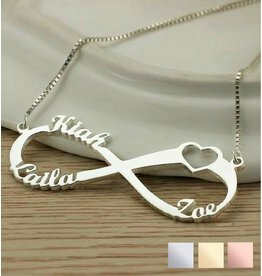 Add the pendant extra personally by adding a name. A great way to keep your loved one close to you. Beautiful .925 silver bracelet with a symbol of Infinity: the symbol of infinite love and infinite friendship. For now and forever! Mothers love to keep their children close, and therefore this baby feet pendant necklace with birth stones is perfect. Engrave up to five hangers with your children's names and choose the appropriate birthstones. Beautiful jewelery made of AAA quality white pearls, pink Swarovski crystal and silver rings. You get the kids necklace and bracelet nicely packed in a sieradenbuideltje. Nice gift for special party! 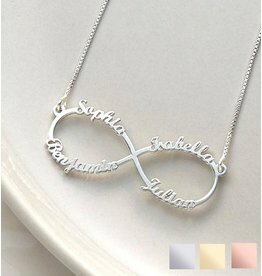 Beautiful door-and-door silver Infinity necklace for a mum with 3 children. 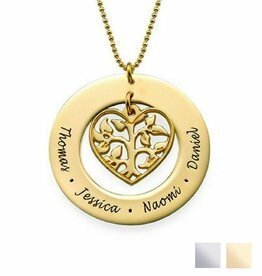 The sweet cut-out heart on the top right symbolizes that all three of your kids are in your heart forever! This Family Tree Necklace in 925 silver can truly showcases who is part of your family. Around the special engraving of the tree you'll see the names of your family members. You can engrave up to five names. For a mother there is nothing more important than her family, hence our Heart-shaped Pedigree Necklace is the perfect gift! Beautiful silver necklace with fine Ininity pendant (1 cm wide). Infinite means "infinite" and symbolizes infinite love. In both children's size (35 + 5cm chain) or adult size (40 cm + 5 cm) available. 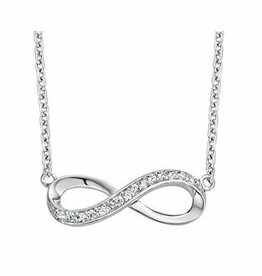 Beautiful .925 silver Infinity necklace. 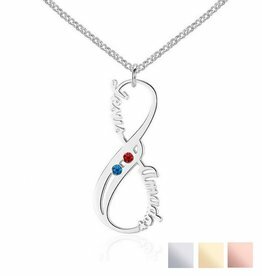 In addition to the infinity symbol, this necklace has an initial charm and a birthstone. Our Infinity kettting 'Close to my Heart' gives the best way to show what the word means "eternal" for you. You can choose up to four names or words on each loop of the infinity symbol. This is the perfect mom gift. We found the perfect gift for mothers, Heart Necklace with two birthstones in 925 Silver! Personalize each heart with a name or a word that you want! This necklace is made of 925 silver and comes with a chain.